There are many instances where you may need your tape cut into different shapes. Some tapes need to be a specific shape to be used on a specific part of a medical device. 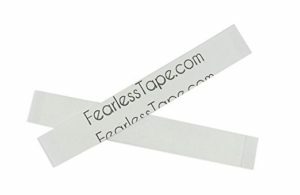 Other tapes are cut into specific shapes to make them more attractive or easier to use for applications like clothing or breast lift tape. The process we use to do this is called die cutting. In this process, we create a steel shape, called the die, that is used with our machinery to cut the tape like a cookie cutter cuts dough. We have several different cut options (including various levels of kiss cutting) depending on your needs. Level 1: The die can cut all the way through the sheet, cutting the shapes out fully as individual pieces. Level 2: The die can cut through just the top liner and adhesive but not through the bottom liner. This can leave the tape cut into shapes but still on one sheet or can leave the back liner longer than the tape to make the liner easier to remove. Level 3: The die can cut through the top liner only but not through the adhesive or the bottom liner, making the top liner easier for end users to remove. And lastly, we can do perforations (level 4). We can also leave custom impressions on a roll and not sheet them if that would be helpful for your production.